Beloved Franciscan priest, Father Benedict Groeschel is the author of more than thirty books and has recorded more than a hundred audio and video series on Catholic spirituality. Now, in this charming classic presentation, you'll see another side of the renowned spiritual director as he shares inspiring stories of the Faith with an enraptured audience of children. 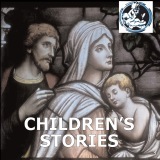 A wonderful resource to help today's children to understand and grow in their Faith and their love of Our Lord, Children's Stories is also a powerful reminder that it was Christ Himself that said, "Whosoever shall not receive the kingdom of God as a little child, shall not enter into it." On DVD for the first time, this enlightening presentation is sure to become a family favorite. A perfect gift for First Holy Communion, watch it with your children and grandchildren and rediscover the beauty of your Catholic Faith through the eyes of a child.